MY old schoolmate and walking companion Pete Frith dropped in for a meal the other night. It’s the first time we’ve seen each other for ten years. We talked about the Lake District because I’d just got back. I said the roads between Barrow and Coniston are narrower than they used to be. I expect it’s down to shrinkage, the weight of dry-stone walls pushing the verges in, and the encroachment of herbage because sheep are seldom herded along the queen’s highway these days. He said it’s because the car I drive now is bigger than the 850CC Mini I used to zoom about in back in the 1970s. Fair enough. I’ll be the first to admit I get things wrong occasionally . . . This is one of those blog posts that begins at the end. We had a good night. I know it was a good night because I had too much to drink and woke up at 4am on the settee, having rolled onto my glasses and flattened them. These things occur. I can live with them. So back to the beginning. It’s a long day. I drive 99 miles from Darlington to Askam-in-Furness, call at my mother’s house, drink the mandatory cup of tea, then drive to Coniston along roads that are definitely narrower than they were 40 years ago. I don’t care what anyone says. They are narrower. Especially the A593 just south of Torver. It’s like an old T-shirt that’s been through the wash too many times. Here’s something that gets my back up. As I turn left in Coniston to head up to the Walna Scar track, I see a road sign pointing to “Retail Outlets”. What? Is the word “shops” not sufficient? When we need to buy food, do we go retail outletting or do we go shopping? Jesus. Sorry about that. I was late to bed last night and up early this morning. Let me tell you about the Walna Scar track. I have a facsimile Ordnance Survey first edition map of the Lake District in the 1880s, which depicts the track as a public road from Coniston, running over Walna Scar pass to the Duddon Valley. 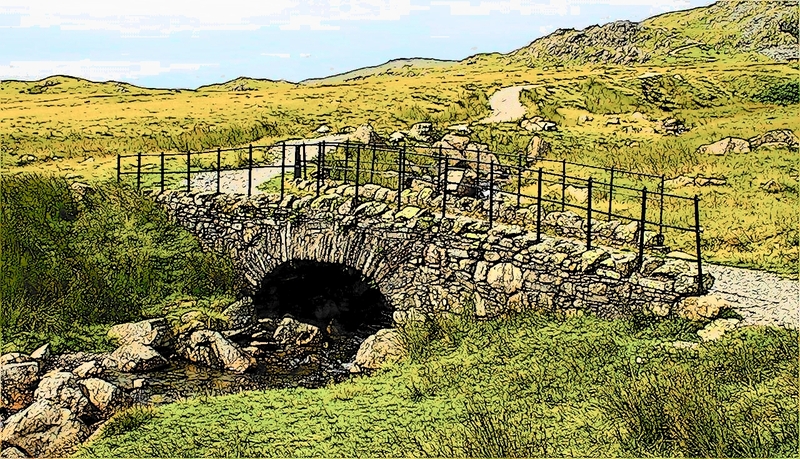 In those days, it was as much a public road as Honister and Hardknott – but like the tracks over Styhead and Gatescarth it just never got tarmac rolled all over it. 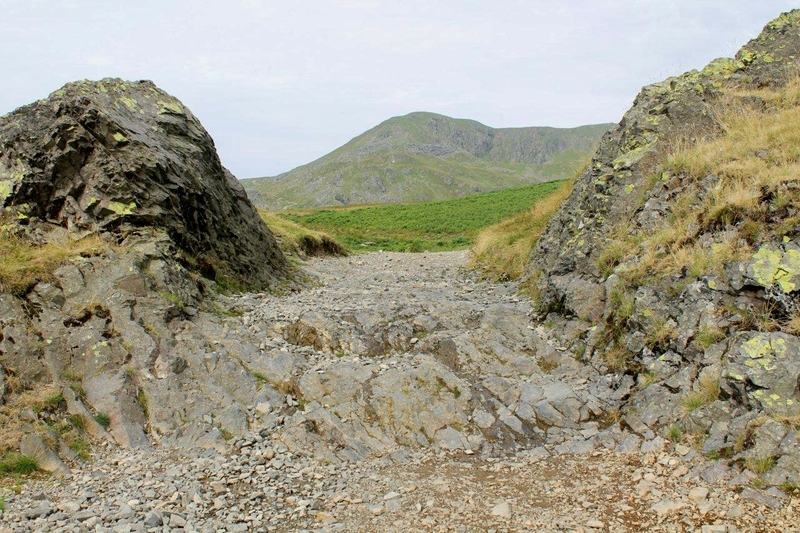 It was built mainly to serve the local quarries – or slate fabrication outlets as they call them in Coniston. So is it a public road or a mountain track? Do an internet search on the subject and a huge heap of documents is revealed, charting a war of words and legal battles that raged until as recently as 2011, with off-road vehicle enthusiasts on one side and local authorities on the other. And the outcome? 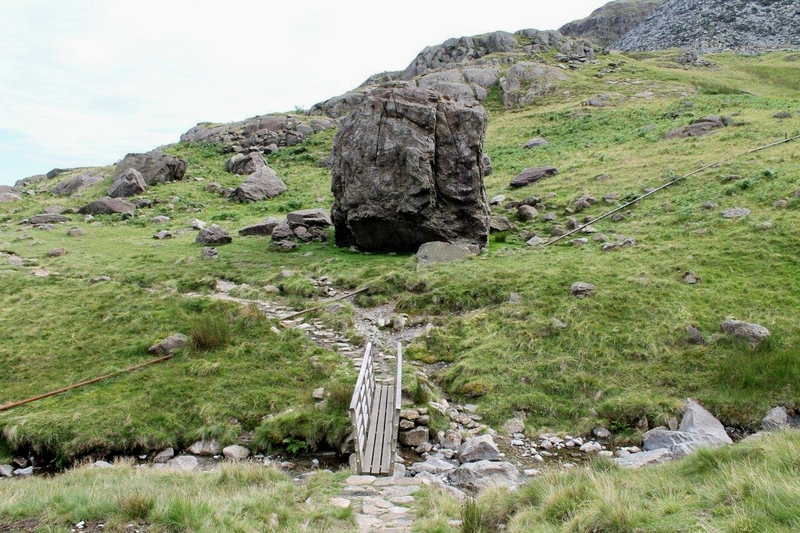 The Walna Scar track is now, officially and legally, a restricted byway, and the only vehicles allowed on its surface are ponies and traps. I like that. The track has been restored in recent years, with a surface of rubble and grit. 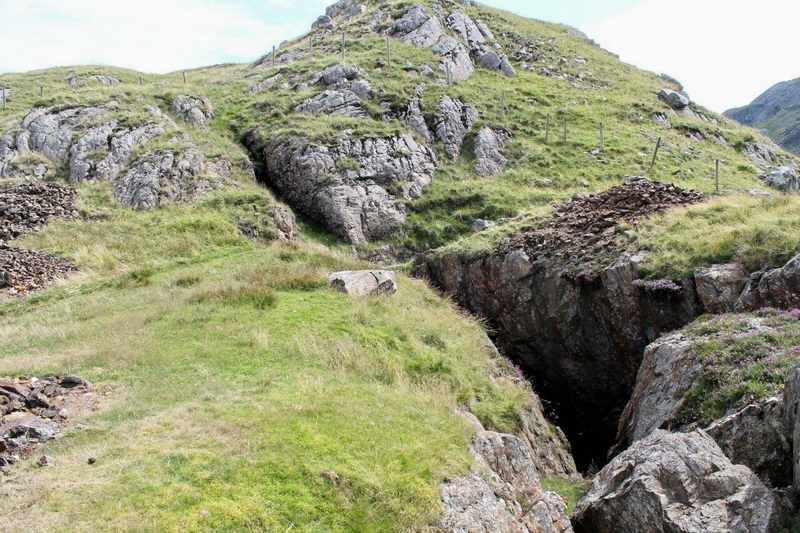 It’s probably closer to its original state now than it has been since the last carts, tinkers, quarrymen and clergymen toiled over the summit all those long years ago. That’s not a bad thing. 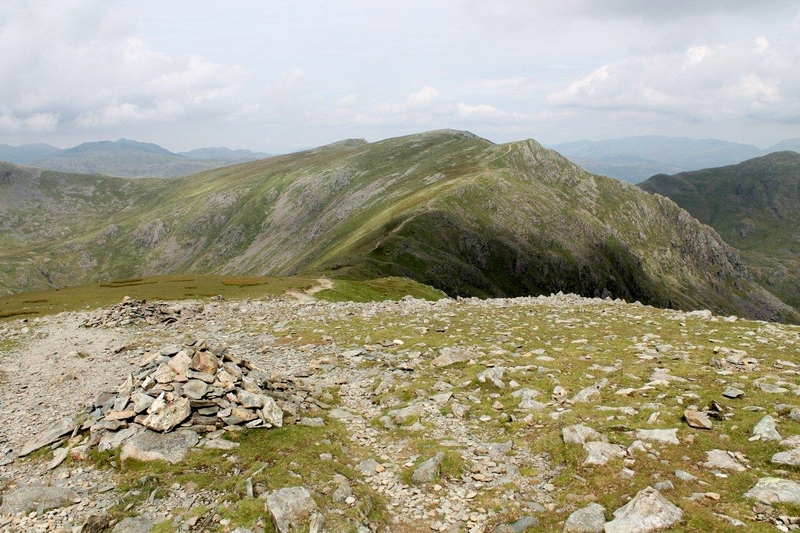 From the top of the pass I strike north for Brown Pike and I’m on the summit (682m, 2,237ft) in what seems like no time at all. I check to see if my watch has stopped. 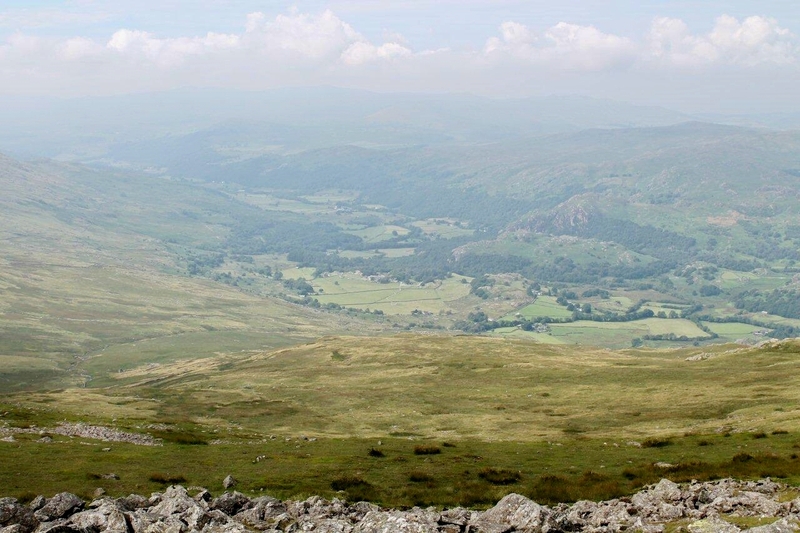 Then I stride out for Buck Pike (744m, 2,440ft) and Dow Crag (778m, 2,552ft). 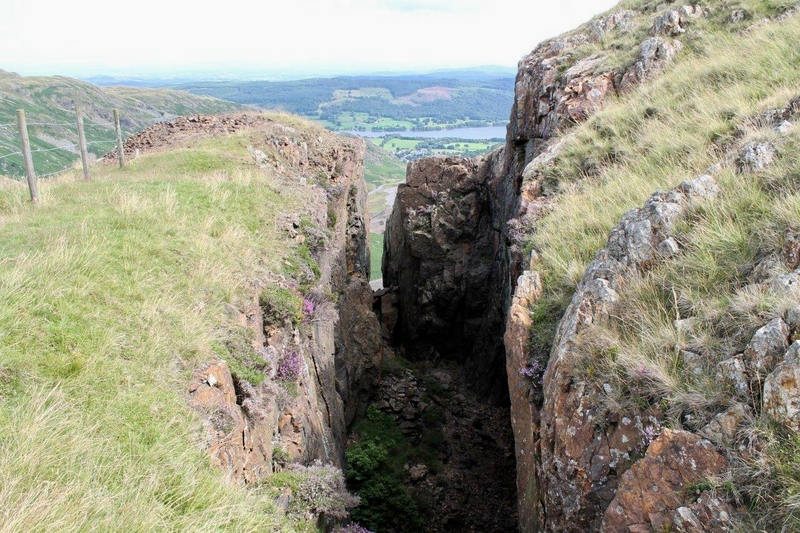 On Dow Crag I eat all my sandwiches. This is a mistake. But I was up early this morning and I only had a slice of toast and two boiled eggs for breakfast. Here’s something. 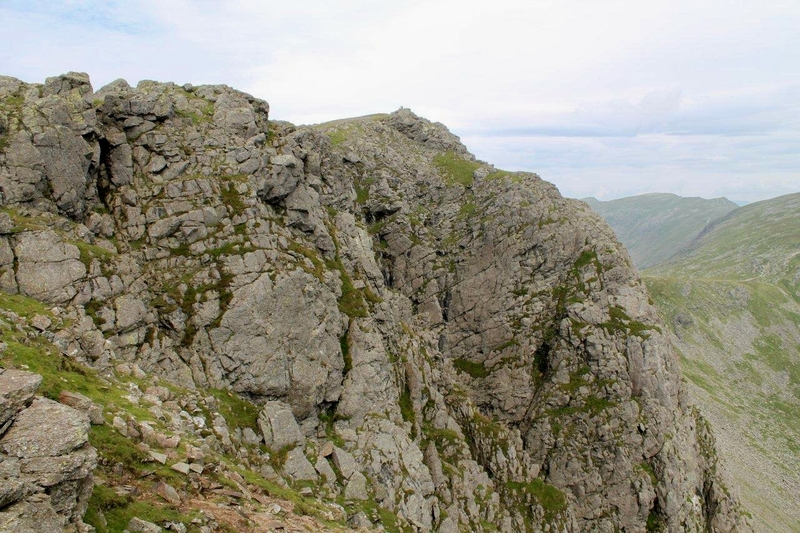 How do you pronounce Dow, as in Dow Crag? Is it Dow, as in how now brown cow? Or Dow, as in doe a deer, a female deer? I’ve heard it pronounced both ways. Just thought I’d throw that in. There’s a climber on this picture. Can you see him? 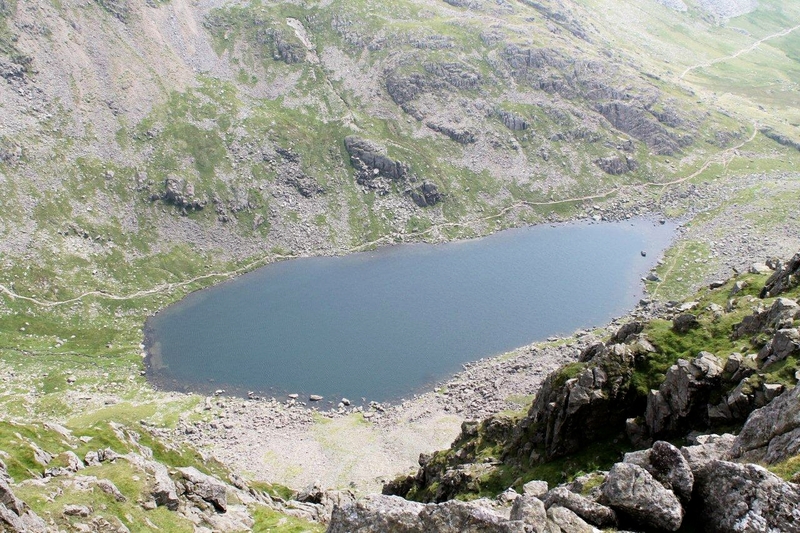 My intention, I told my mother and wife before setting out, was to climb Dow Crag then drop down to Goat’s Water and return to the car. 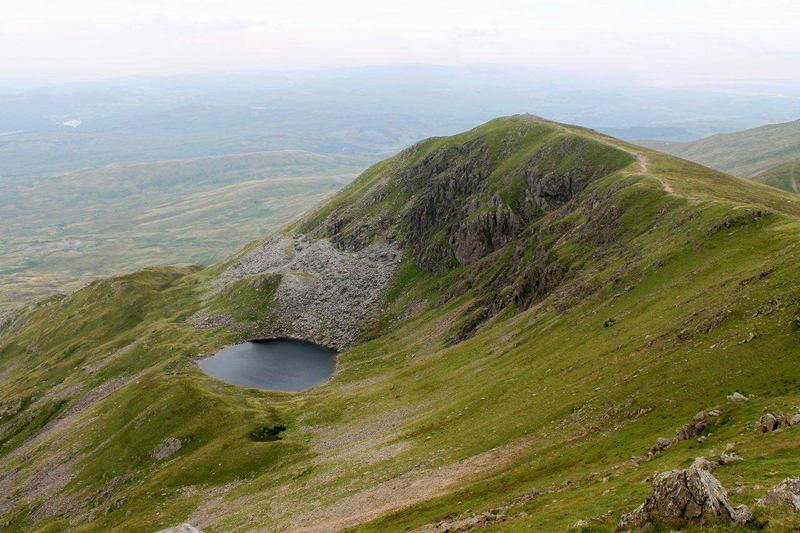 But despite a late start, and because I’m making good progress, I decide to hop onto Coniston Old Man (803m, 2,634ft) – the first mountain I ever climbed. It will be a nostalgia trip, I tell myself. The Old Man is always a pleasure to climb. There are crowds of people on the Old Man summit – more than I’ve ever seen on a summit before. It’s reminiscent of those schoolbook pictures of the Sermon on the Mount, only without Jesus. I’ve no sandwiches left but I might scrounge some loaves and fishes if I’m lucky. Again, everyone is dressed smartly, or smart-casual, or smart-sporty, or smart-outdoor-chic. I’m at the outer fringe of the casual spectrum. Sort of extreme-casual bordering on ethnic-peasant-refugee-casual. I don’t know how people manage to stay so clean and look so fresh while climbing mountains. Perhaps these observation say more about me than them. I’ll move on. I’m feeling good, partly because I appear to be walking well and partly because everyone up here is happy and having a good time. There’s a seaside, roll-up roll-up, wish-you-were-here, kiss-me-quick atmosphere. No loaves and fishes though. 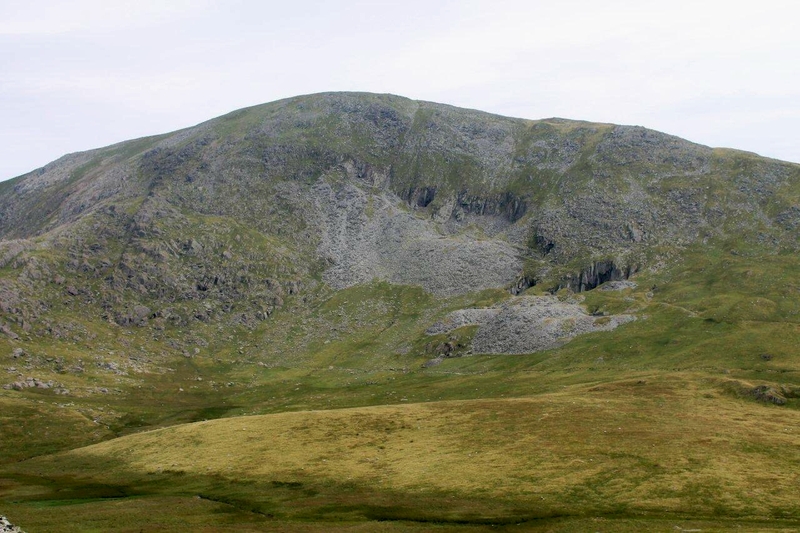 So I decide, in a moment of uncharacteristic bravado, to extend my walk even further and strike north over Brim Fell to Swirl How (802m, 2,631ft) and perhaps drop down to Levers Water and the Paddy End copper mines. Off I go. I’m crossing Great How Crags when a realisation dawns. 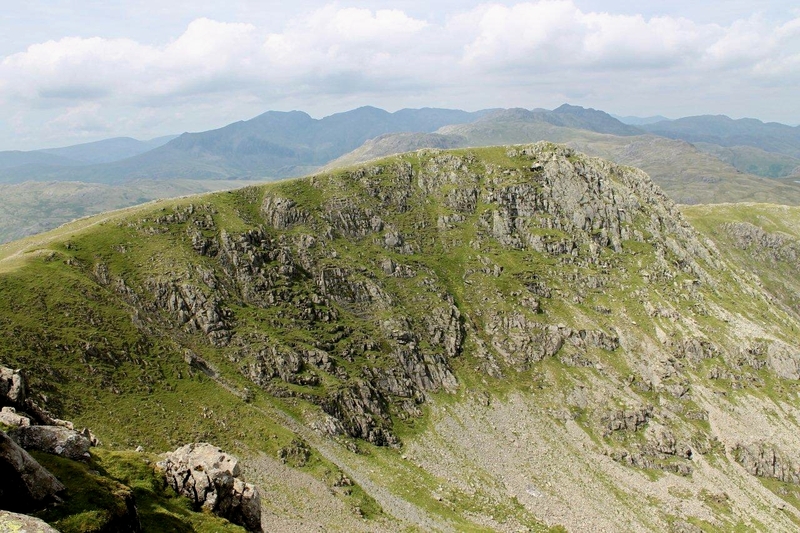 With the bulky mass of Grey Friar to the west, and Wetherlam to the east, it would be within my grasp to top all the Coniston fells in one glorious swoop. It’s a tantalising thought and I give it serious consideration. 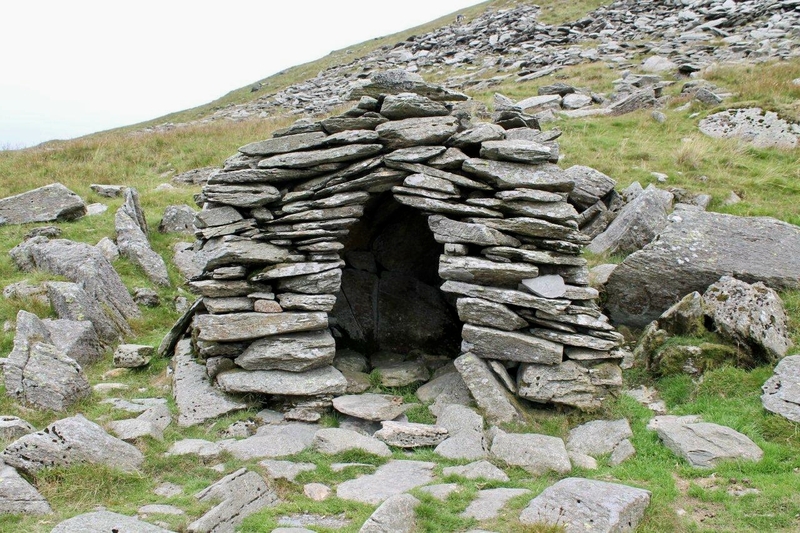 But on arriving at the lonely cairn on Swirl How my stomach starts rumbling alarmingly and I’ve nothing in my sack to replenish my energy reserves. Shackleton would not have baulked at the challenge, I’m sure. And neither would I if, like him, the alternative had been four years in a trench on the Somme. 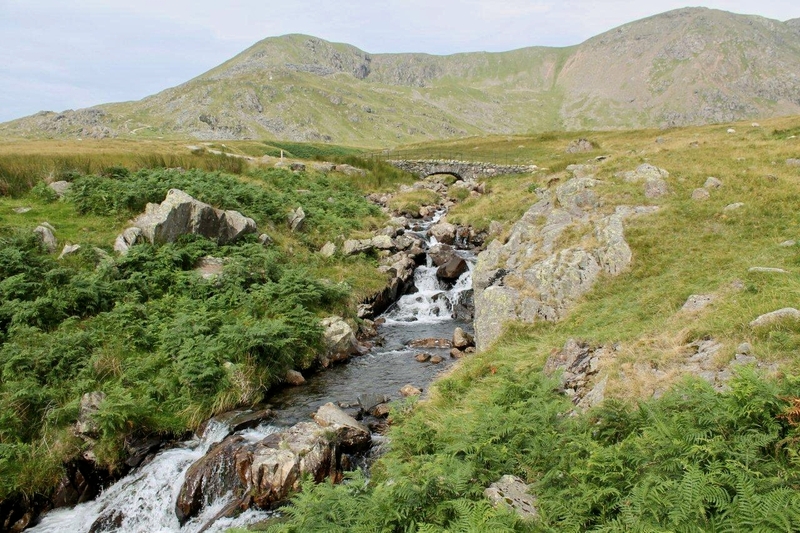 So, with an air of reluctance, I wander down to Levers Water and the ancient Back Strings copper mines, then descend to Paddy End to follow the course of an old waterwheel launder (flume, race, leet, lade) across the foot of Brim Fell to a track that skirts pleasantly through bracken and soft turf to the fell-gate on the Walna Scar road. It’s been a satisfying walk – unplanned, spur-of-the-moment, make-it-up-as-you-go-along stuff. Must remember to bring more sandwiches next time. And buy some new shorts. And complain to the authorities about the narrow roads. 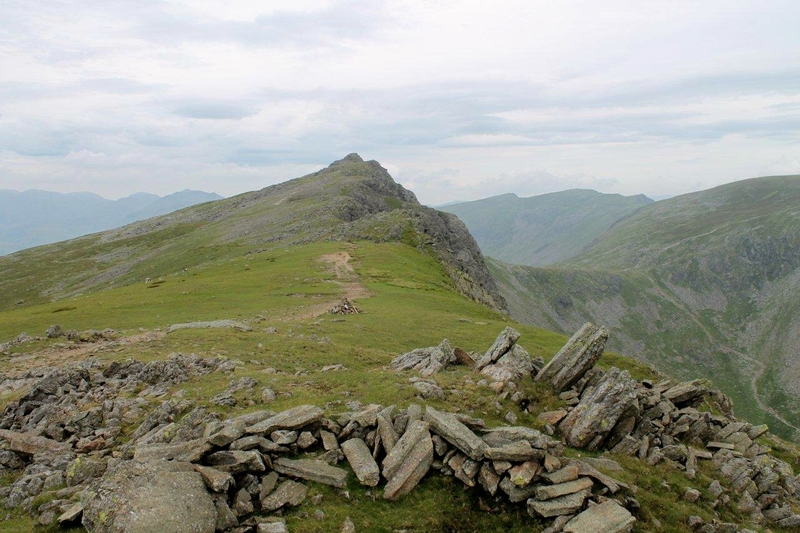 This entry was posted in Climbing, Environment, Footpaths, Hiking, History, Industrial archaeology, Mountains, Quarrying, Ranting, Slate quarries, Walking and tagged Cumbria, Lake District, Mining History, outdoors, The Lakes, transportation, WPLongform. Bookmark the permalink. Hi Matt. I could have done with a couple of pints of Old Man, but it’s not a good idea when you’ve a long drive home. It did cross my mind to call in the Black Bull because I worked there once in the kitchen during a school holiday when I should have been revising. Nice place Coniston. Old Man’s my favourite. Fortunately I want driving and two became a few more the following evening. 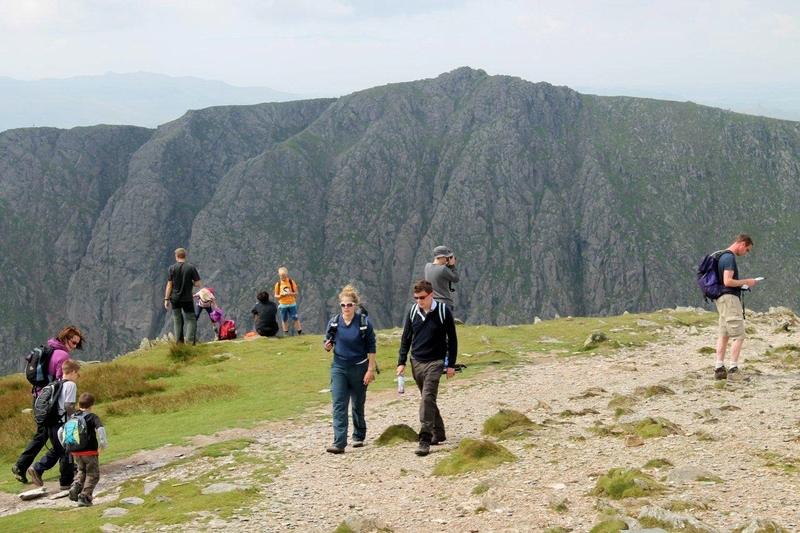 That’s just about my favourite walk described there – I love the Connies. I saw Dow as in to rhyme with cow. But I gather it’s supposed to sound like doe if you’re proper Cumbrian. As to food, I’ve trained my body to go without food (or much drink) while I’m out and I just catch up when I get back. I usually just take a couple of shortcake biscuits as they have plenty of fat (for long-lasting energy) and sugar (for an instant boost). Chocolate is also good. I find sandwiches just make me thirsty due to the bread. Hi Carol. I’ve always said Dow as in cow. I’ve found older generations tend to use the alternative pronunciation. Perhaps they’re right, but I’m old enough without trying to sound older. I’ve found that if I don’t eat during exertion I start feeling light headed and lacking energy. Samwidges and nutty bars are good. I went through a sardine phase but that can get messy. I expect those lasses were frozen. Mind you, I see girls walking round Darlington on a Friday night in the middle of winter wearing less than I’d wear on a beach on the Costa del Sol. So there you go. God yeah – girls on nights out. I remember setting off to work on the train and was waiting on the platform around 0600. There was a girl wearing not much still going home from the night before and it was snowing and frosty – ouch! I have mixed feeling about a lot of the very popular spots like this. On the one hand, there’s no joy in walking somewhere it it’s like downtown Manhattan. On the other hand, sometimes I really enjoy that sort of sense of fellow-feeling and friendliness you find. A mixture of both is best, I suppose. Hi Roamaingmind. I must admit, when I first got up there I thought: I don’t need all these people because this isn’t what walking is about. 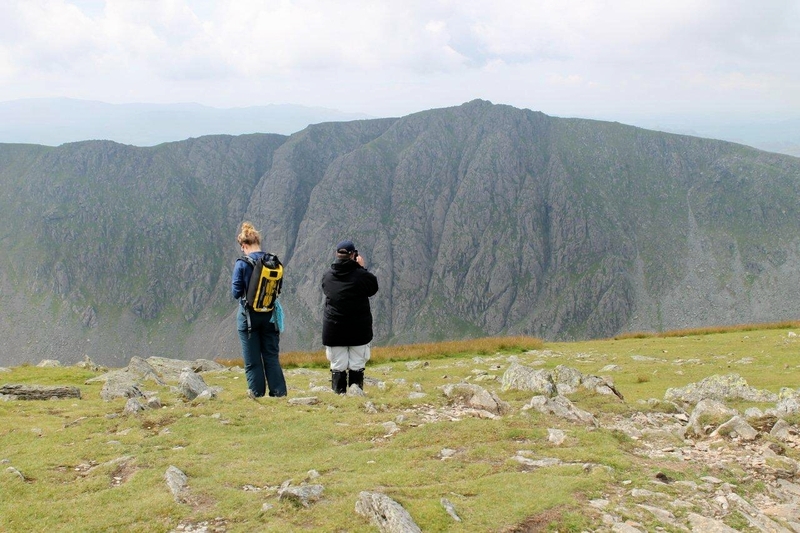 Then I decided that if people are enjoying themselves and the environment – which they were – and introducing their kids to the great outdoors, then I should accept that with a good heart and make the most of it. 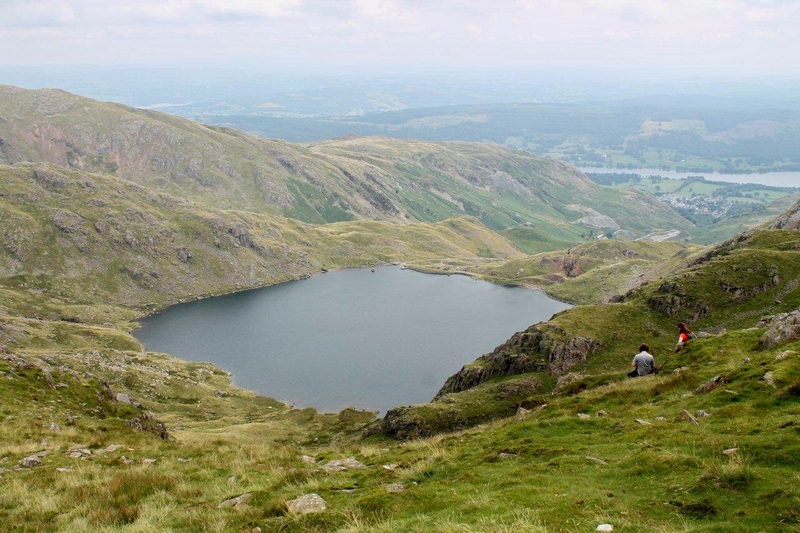 There are plenty of places in the Lakes where a chap can walk all day and not see another soul. Dow as in cow for me as well. 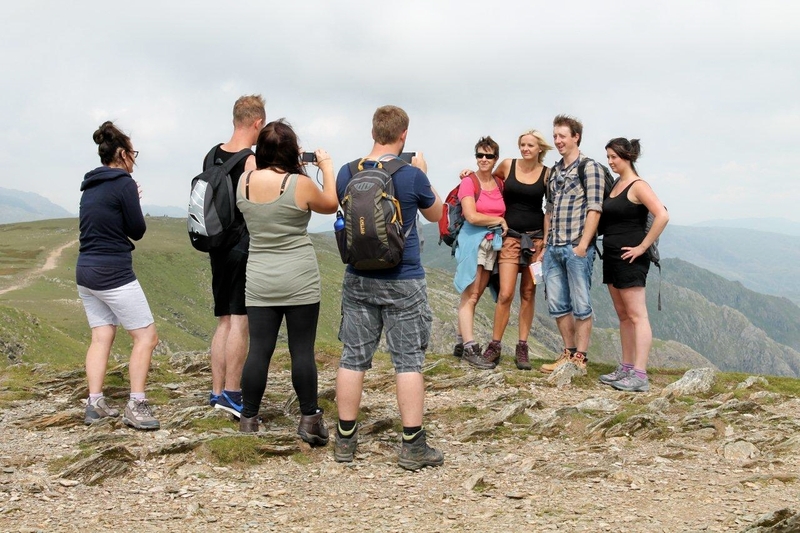 While I am not a misanthrope when it comes to the hills, I don’t think I would have enjoyed the summit with all those folks on it. Still, a couple of weeks of the weather reverting to the norm and it will quieten down again. Astonishing photos again 🙂 I put them up on the BIG computer screen so I could feel the air blowing out of them. Hello Mrs Potter. I’ll have to try that myself. Someone should design an app (or whatever they’re called) so if you click on a picture you get the sound and scent of the wind. Your seaside pictures would work well. The roads are narrowing, the signs are changing, and one day the fells will be renamed active vertical recreation facilities (natural). I still haven’t got round to doing the tops around the Old Man in spite of the Walna Scar road and accessibility of Coniston, but I’m no stranger to a pint of Old Man and Coniston Bluebird. Pity you ran out of butties. Who knows where you might have ended up. Hi Chris. Yeh, I can’t stand all that council-speak, business-speak stuff. People who churn it out should be taken to the local domestic waste disposal centre and recycled to reduce the excessive verbiage footprint. 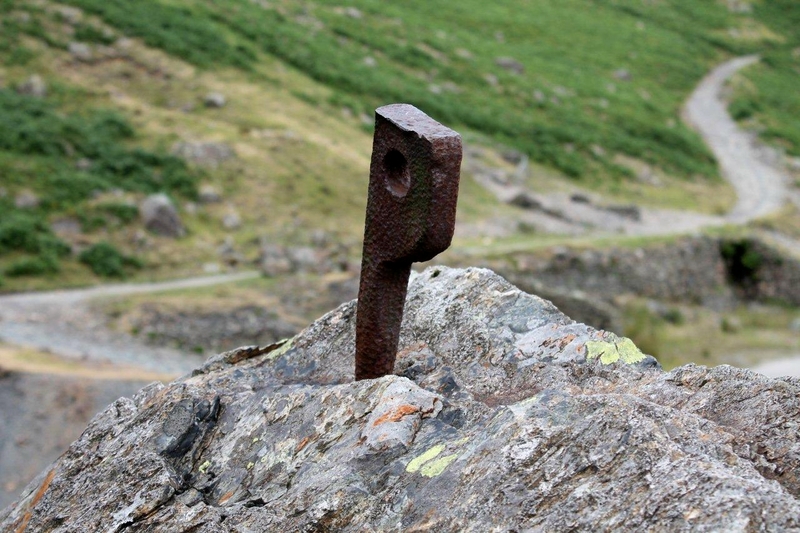 I’m with you on the Old Man and Coniston Bluebird. Can’t beat a good pint at the end of the day. 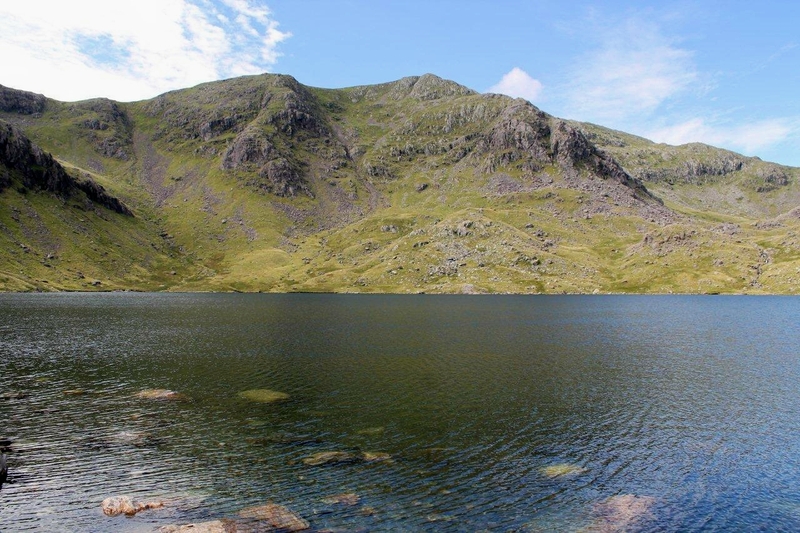 This was a great route & its such a shame you didn’t pack enough sandwiches to continue your Coniston tour, oh well another great reason to return in the future. 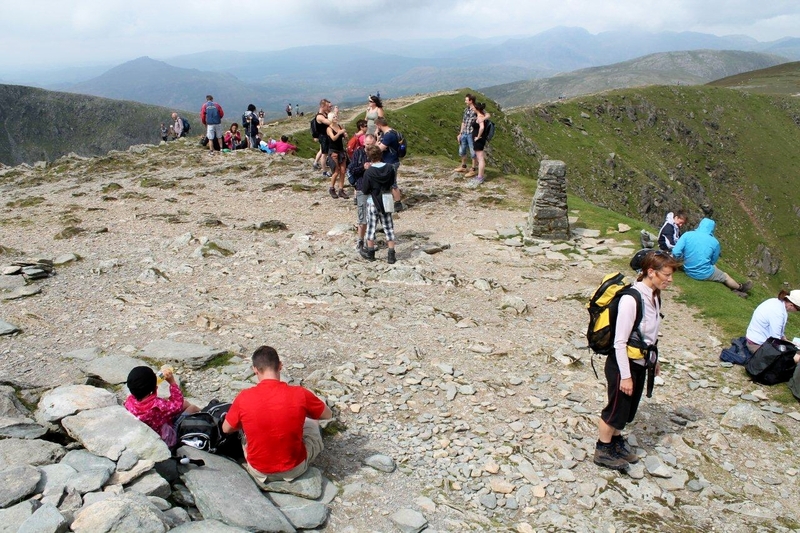 I’ve seen Coniston Old Man busy, but not as busy as your photos, I’m not to sure if its a good or a bad thing…but that’s just me getting old. Hey, if you’re getting old Paul then what does that make me? 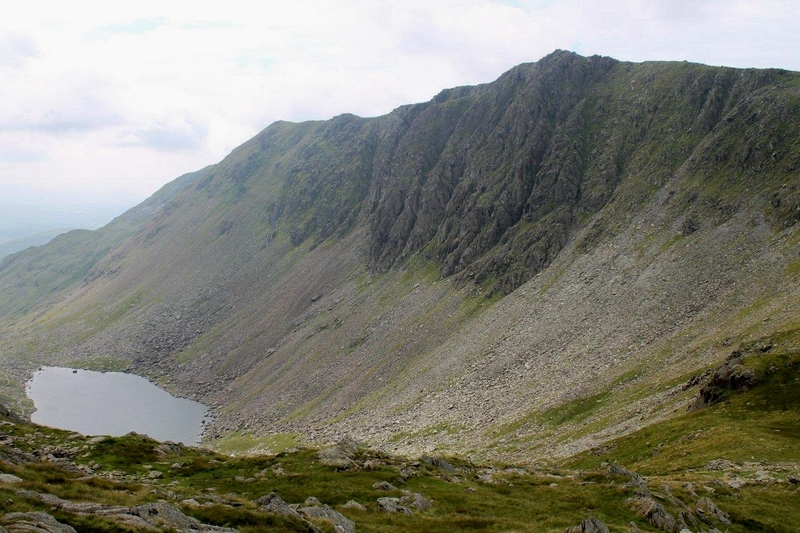 I’ve always wanted to do the full Coniston round and I shall have a crack it it one day because all it needs is a bit of forethought to take advantage of the best routes and the scenery. 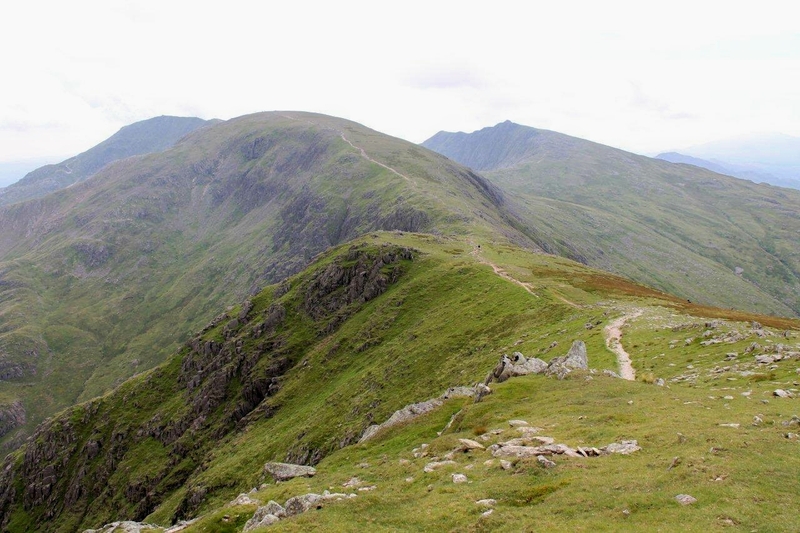 I think it would be best to start at the Wetherlam end and finish on the Old Man or Dow Crag. I’ll give it some though over the winter. When I read that you had run out of supplies, my stomach began to growl at the thought, actually, I am famous among friends for that ability. It is uncomfortable, as it reduces the ability to deliver. With the lack of water, it goes fast. I laughed at the fashion show at the summit. When we are out on long walks, we have two sets of clothes. We use the clean set of clothes in the evening. After a few days, we will exchange around and have a laundry day. In this way we reduce the weight. When hiking in the mountains, your values ​​change and it becomes a luxury to be clean and having eaten a good meal. Hej Hanna. Yes, it’s all down to being prepared. I set out for a short walk and ended up doing a long one – but I should have taken extra food just in case. And I still haven’t had my glasses fixed. I think in the mountains, especially on long trips, your values do change and you have to make the most of the circumstances. 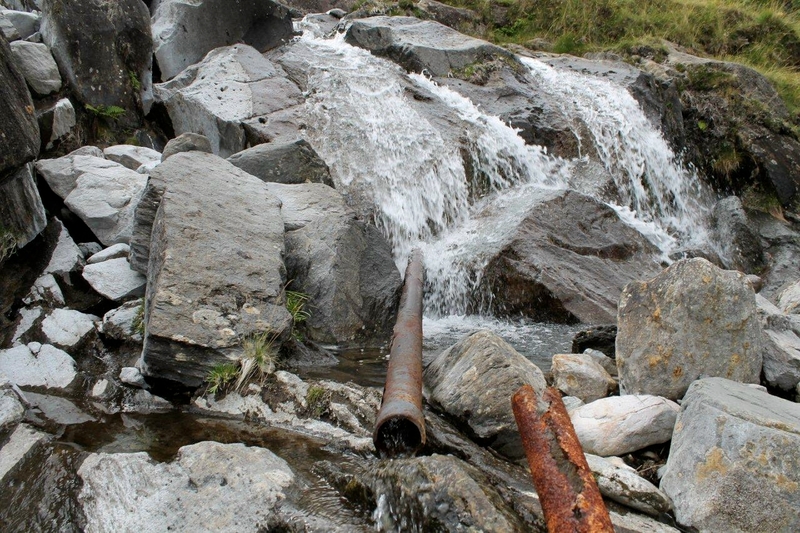 Having a bath in a mountain stream can be an enjoyable experience on a fine day, but not very appealing if the weather is cold and wet. Hot showers and good meals really do become a luxury in those circumstances. I can’t imagine how I missed this post, but it was a real joy to read. Those names are familiar to me even though I’ve never hiked there. Some day, I hope! Thanks for the great photos! Hi Jeanne. It’s a magical place in its quieter moments. I hope you do get the opportunity to visit sometime. Every season has its particular delights. Hi Martin. Thanks for that. 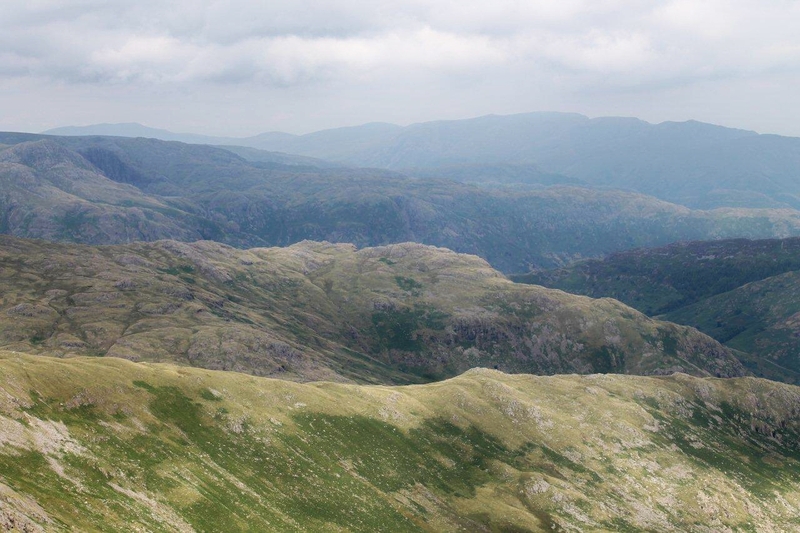 Next year, when the days begin to lengthen again, I shall pull on my boots and go for it – Wetherlam first. 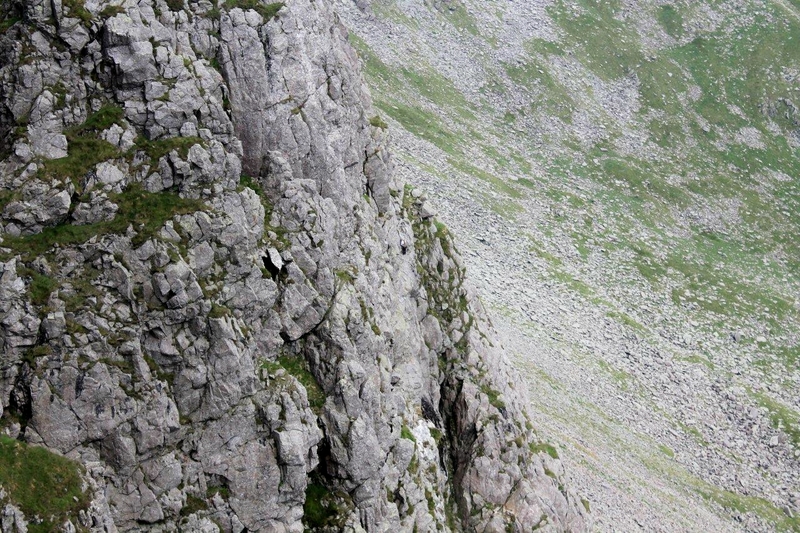 For what it’s worth, the early editions of the Fell and Rock Climbing Club guides to Dow Crag had it spelt as Doe. This was changed to Dow in later editions, but perhaps a clue to the pronunciation lies there. Ah, now that’s interesting and perhaps sheds some light on the issue. Thanks for that, Ian.